I was spending some quality one-on-one time with my 4-year-old, Fiona, last week. We were in my bed reading books when the phone rang. Normally, I’d have ignored it, but it was the pediatrician returning a call. I told Fiona I’d be right back and ran to take the call. I returned less than five minutes later to find she had made her way into my bathroom, ransacked my makeup and covered every square inch of her face in a blend of bronzer, concealer, loose powder and lip gloss. She was applying mascara (rather adeptly) when I walked in. On her feet was a pair of black patent wedge heels. I can’t be the only parent constantly fielding these sorts of questions, on subjects ranging from earrings to cell phones. Often I find myself spitting out arbitrary responses, with little forethought, just to buy myself some time. Eleanor Menzin, a Boston pediatrician, says that while in some cultures ear piercing is done at birth, “it depends on what is appropriate for your cultural group.” She suggests considering whether the child is willing and able to take care of her newly pierced ears — or at least let her parents help. When my husband and I sneak out for dinner or a movie, we field about 3,000 calls from the kids. (“Yes you can have a second bowl of cereal,” “No, your brother cannot put ice in the bathtub.”) The absolute last thing I want to do is find more ways for them to call me. But I know I am swimming against the tide. If there’s one thing that everyone agrees on, it’s that this is, as Natterson puts it, “the $64,000 question these days.” She doesn’t buy the argument that kids need phones for safety reasons, because there are already many safety measures both in place and available for young children. If parents choose to give their kids a cell phone, Natterson suggests limiting both Internet access and texting — even for middle-school-aged children. Finally, says Menzin, if you’re going to get your child a smartphone, no matter what the age, it gets turned off and turned over to parents one hour before bed. I think that sounds like a smart smartphone idea. Public restrooms are the bane of my existence. Sending a kid alone to a restroom, let alone one for which you’re likely to need a tetanus shot, can be downright scary. This is a situational issue. For example, many parents wouldn’t send a middle schooler to the bathroom alone at a ballpark or amusement park, but would send a 9-year-old to the bathroom at a local restaurant. Menzin suggests finding out whether the bathroom has a single stall or multiple stalls. Frankly, this is one of the few times I’m happy I had a gaggle of children. Sending them to a public toilet in groups of twos, threes, even fours, is one way to keep things safe, and one way to guarantee that I can sip my latte while they do it. If they’re not in a group, I like to wait until they’ve reached double-digit ages. My sister-in-law recently asked me if I’m psyched because in a year I’ll have a 12-year-old who can officially baby-sit my other kids. I could not, at that moment, think of all the money I’d be saving on baby-sitting because my entire body was overtaken by the cold chill that ran down my spine. Cunningham cautions that children should not be left alone “until they can demonstrate good, safe behavior while their parents are at home,” adding that the child should know how to access and use all of the things she needs to stay safe, such as the fire alarm and security system. Peta Mehlman, owner of Custom Travel Adventures and a travel consultant based in Seattle, says airline policy dictates that no children younger than age 5 can travel unaccompanied. 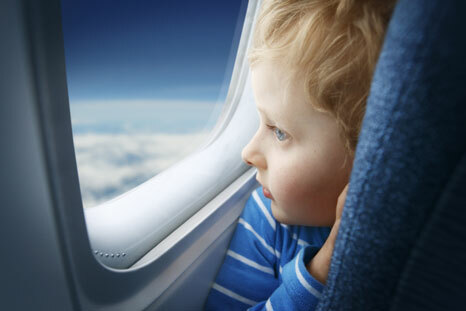 American airlines also stipulate that children 5–14 can only travel on direct flights. Mehlman suggests considering whether the child is both mature and independent enough to be in an unfamiliar environment in the “company of perfect strangers,” and if traveling internationally, is able to handle issues such as flight delays and rerouting. Cunningham let his 9-year-old travel to visit her grandmother alone and suggests discussing the routine with your child beforehand to prepare her for the experience. Natterson adds that much depends upon your kid’s personality and the logistics. “You just have to know your kid,” she says. “Children are rarely ready for sleepovers before 8,” cautions Menzin, adding that some children are not ready until later. Cunningham says his wife insisted on waiting until each of their children could sleep through the night without wetting the bed before spending the night out, and that he wanted his kids to wait until they were comfortable falling asleep somewhere else. “The bigger deal for us was who our children were having sleepovers with,” he says. “We wanted to know the children, the parents and other family members as well, just to make sure they were going to be safe and have fun.” He suggests beginning sleepovers with family members or good friends who have children of a similar age. Menzin adds that it’s important to consider what you know about the hosts and the level of supervision they will provide, and whether there are weapons in the home. I think the real question here isn’t whether kids are old enough to handle a sleepover, but whether you as a parent want to deal with your child the day after she’s been at a sleepover and got about eight minutes of sleep. Lea Geller is a part time lawyer and full time mother of five. She lives in Seattle and blogs about her misadventures in parenting at This is the Corner We Pee In.